You’d think with their previous track record, Lucasfilm and Disney as their parent company, would avoid prequels. The Star Wars prequel trilogy is not fondly remembered and many blame it for ruining a (practically) perfect trilogy series. This prequel has been met with trepidation also, especially because it deals with a character as popular and sacred as the original trilogy people work so hard to defend. Although Solo is not the “disaster” the prequel’s become renowned for, it isn’t the movie the potential of a Han Solo back-story could have been. It has a lot of strong aspects. For starters, it is cast very well, with Alden Ehrenreich playing Han Solo with confidence. Smartly, the actor doesn’t do a Harrison Ford impression but instead focuses on the smaller, recognisable features that make Solo the man he becomes. This can be mimicking the way Ford uses his pistol in the original series through to the cocky smile that makes him such a likeable character. Ehrenreich also has a great chemistry with Chewbacca. You see the beginning of this friendship and it is written very well and acted even better. You believe in the story that will bring these two characters from acquaintances to complete brothers-in-arms. Add to this a perfect performance from Donald Glover, who plays a perfect Lando Calrissian. This is much more of an “impression” but one with charm and the right amount of humour. The “new” characters have more of a challenge and their impact is varied. Some, like Thandie Newton’s Val and Paul Bettany’s Drydan Vos feel wasted considering the talent involved. They do a good job and wish for more of a story involving these players. Luckily, both Woody Harrelson’s Beckett and Emilia Clarke’s Qi’ra get much more to do and develop much more interesting characters, even if the latter feels little more than a relationship MacGuffin at times. Interesting characters don’t mean much if the story they are involved in doesn’t excite and interest. 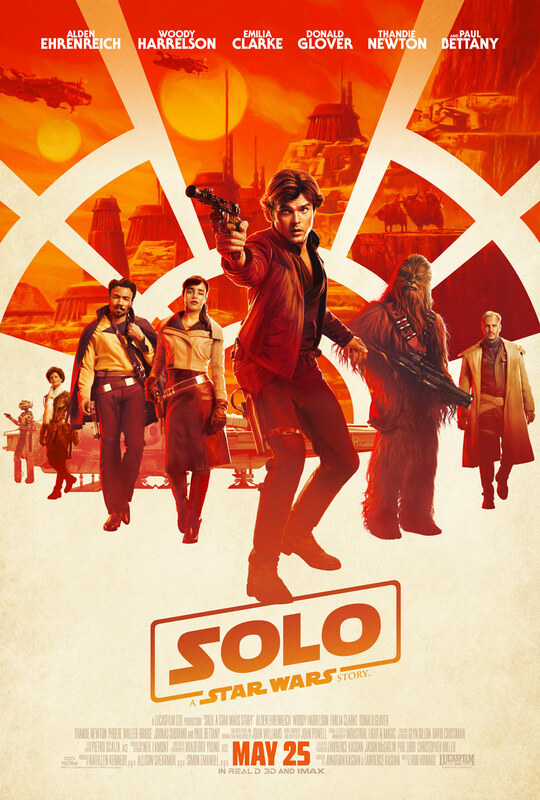 Solo has a lot of interesting areas to explore and gives background to who Solo is, where he comes from and more importantly how he gets the Millennium Falcon and that famous “Kessel Run.” There are some great set-pieces, from a thrilling train-robbery to chase through an electrical “space-storm” and the movie is never boring and will keep you entertained. Unfortunately, it never really feels like a “Star Wars” movie. There are moments which bring the “Star Wars Goosebumps,” especially anything that subtly foreshadows the epic moments from the original saga, but aside from the fantastic use of John Williams’ score, the movie never gets above average. It is a heist movie at best, with elements of western, but the epic, “Star Wars Saga” feel you hope for is strangely absent. This could be down to the choice of director. Ron Howard is a great director but he is more adept at delivering a compelling story in a very solid way rather than pushing the envelope and taking the risks that fans of the series would be looking for. This is apparent in the way that Solo delivers a very well-told, clear tale but in a fairly pedestrian manner. Overall, Solo is a solid instalment in the Star Wars series but doesn’t do enough to live-up to the heady-heights of the classic trilogy. It is well-acted and aspects of the story it fills-in work very well but the movie delivers a very pedestrian tale which never gets above average in it’s execution. Yo dude, great review. I think we’re on the same page here though I think I may have enjoyed it a little more than you. I went into the film thinking it’d be pretty meh considering the trailers, which got better with each new one, but it was a film I didn’t want and the behind-the-scenes drama made me sceptical. But in the end I enjoyed the film far more than I expected. I liked seeing different sides of the SW universe in terms of the planet and some of the moral and ethical material and tonal differences from the main episode series. The film definitely could have been more daring with the story and the utilisation of a good few of the characters could have been better. But I expected something terrible, and it was way more interesting and fun than I thought it’d be. Next Next post: The Brand New Views from the Sofa!! !